Creatively advertise the delicious entrees, side dishes, or desserts in your buffet line with this American Metalcraft TAGA7WT chalk card. Each pack of cards comes with tag holders for easy display and a mini-tip white marker for smooth writing and can be wiped clean after each use so you can use the cards multiple times. The contrasting colors make for easy identification to keep the buffet line moving quickly and efficiently! These are so cute I will be ordering 2 more packs and they were with multiple card holders. I purchased the silver one for a fancy look. We used these to label the many types of home made cookies on the dessert table at our engagement party. They were the perfect size to the list both the cookie type and baker. These are perfect for labeling products in a display case. A good size and they hold up well to different temperatures. They hold stickers well. Good investment since it was not very expensive and was able to use it for labeling our service line and the variety of drink potions we have. Cute cards used to label items on graduation buffet. Used chalk marker which looked very nice but did require damp cloth for complete removal. Very cute! These chalk cards are convenient to write on, though they do have a small issue with residual writing from previous messages if left on the card for more than a few days. These are a great product!! We have them in many different sizes. We use them regularly at our shop and for catering. I use different holders because I am not a fan of the plastic ones, but the plastic ones work just fine. I love these mini chalk cards and displays. They are super cute and easy to write on. They are perfect for a pot luck or dinner party. i would recommend. These mini chalk boards work great for advertising our high end chocolates in our candy and chocolate shop. Did not come with many stands for the cards so had to purchase additional card holders else ware but they do look very nice in the display. Overall, these are OK and get the job done. However, be aware - it says that the material is "chalkboard," which I assumed would be some sort of slate or metal; in fact, they're just thin sheets of textured plastic. I'm not a materials expert, but I do think that if they were a different material they'd hold on to the chalk marker a little better - as it is, the chalk very easily comes off of the little cards, so if you're reusing them as I do, be prepared to do a lot of touch-ups. Cute mini chalboard. This kit came without the marker, which was ok because we ordered two. My only regret is that the kit contains 20 chalkboard and only 6 "holders* ! the pen takes a lot of work and shaking to get it to finally work, but once that happens its all gravy. this is a great multipack of cards and i use them for all sorts of catering jobs. I used these to write table numbers at my wedding and they turned out beautifully. Just remember to wipe it clean with water and then dry it. These signs were perfect for my catering events. It looked very professional (compared to an index card). I also ordered additional holders as well to go along with the extra signs. Super Cute for pricing signage. I love the fact that I can quickly change the signs wording. Then pen included works great. I also ordered other pens in more colors. They look great on my table at the farmers market. These work perfect in my bakery cases to label what is on each tray of baked goods. They wipe of easily too for easy changing over of different products. These little signs are super useful and versatile. The little stands they come with are a little wonky, but the signs work in other clip stands and also work well with tape on the wall and what have you. The pen takes a bit of getting used to, but once you get it, it's great. Definitely helping with sales. These are awesome little signs! The pen you get with it is white but you can also order the color ones separately. Super cute and wipe out easily. I love, love these. They make it so convenient for everyone to know what was in each chafer. Everyone wanted to know where did I get them from. These were a great purchase for our pre-made sandwiches. If you have someone on staff with neat handwriting, these create a chic yet simplistic look while properly labeling foods. Bought this item for my restaurant for every day use for buffet items , its very easy & simple to use .Been using this item from last couple of months ...highly recommended ! These cards are amazing! My display just got a major face-lift with these. I also bought the 6"x4" size and both are great. Using the white chalk pen on these is so nice. You can see the cards from a long way away. They are easy to clean with water and a paper towel and they can be used over and over on the front or the back. I don't plan to be without these from here on out. We love the ease of these chalkboard signs! Easily washed and reused, they offer a professional look to our bakery. The chalk marker creates a nice fine line. The mini chalk signs are great. They are easy for us to change from event to event. They do not take up much room, which is nice when you have a full display. Check size on these tags, they work OK, but are hard to clean, and you need to use a fine point chalk marker to write a clear description. very nice looking and professional presentation though. I like the quality I read other reviews and knew they were not actual chalk boards but the write and erase option comes in handy for what I need them for. We use these in our bakery cases. They do not take up too much space and are still large enough to easily read. And they are easy to wipe clean so we can change the specials each day. We used these at a bridal shower. They started as place setting tags then later we used them in the party games for everyone to write & show answers to questions about the bride & groom. It was hilarious.! Had to keep answers short because the card was small, but it worked out well. These are so easy to write on and they wipe off very easily. The marker that comes with the chalk cards writes easily but naturally starts to break down after a lot of use. It is easy to replace, however. They are nice in concept but they don't meet the quality standard that I was expecting. They are really just small plastic tags that look cheap compared to the stone holder. Thanks for your review! If you are looking for another type of tabletop sign, we carry a wide variety found here. Great little sign. Needed something that I can change every day and this chalk board works great. Easy to clean and you can use both sides. These cards are perfect for displaying menu item names on a buffet line. They are easy to erase and rewrite without having to print new cards each event. We went a head and purchased these cards when we made our recent transition to a more upscale coffee shop and they have been great. No smearing and no residue upon erasing the day before's info. Thanks for your review! We carry the stand you are looking for! The Black Acrylic 1" Cube Card Holder can be found in the Companion Items section. These little signs look great on our tables. We use them with a small menu card holder and now are able to let customers know of any specials we have going. And they are very easy to change whenever needed. 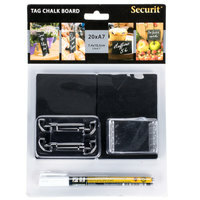 American Metalcraft TAGA7WT 4" x 3" Mini Chalk Card 20 / Pack are great for buffet and catered events. Look great and are easy to write on and even easy to clean and reuse.